The inevitable has officially occurred, my postpartum shedding is back after baby #2 and it means business! In the pictures I posted above you can see the thinning of my edges and it’s killing meeeeee! I had such thick, voluminous hair during both pregnancies, it’s such a shame that it never lasts. You would think it would be our consolation prize after childbirth or something! I remember after I had my son, roughly 3-4 months postpartum, I noticed my edges were thinning out majorly and so much of my hair was falling out.. At first I thought it was this new product that I had been used for the first time from Shea Moisture until I remembered it was just the start of my hair shedding. At the time, I didn’t know how much hair would be lost or how long it would take for me to get back to my healthy head of hair. It was honestly so stressful because something as simple as running my hands through my hair would result in more hair loss. Fast forward to my current postpartum shedding experience. Since I knew what to expect this time around I wasn’t as surprised, but I was just as disappointed. I went from having fully plump twist-outs to sad thinned out edges! I showed my husband my edges and was telling him I was sad that I was losing so much hair there. He literally suggested I shave off my edges all together LOL. ugh. Keep in mind, when I had my son and my hair was shedding he also suggested that I just shave off all my hair. So that’s always his solution-- just shave off the problem area haha. Anyways, after my 3 year natural hair journey I couldn’t bare to part with any of my luscious coily coarse 4C strands! I wanted to share the top 3 ways I will be working to combat my postpartum shedding and document my journey back to healthy hair! *Pre-Poo (watch this video here ) it is the best, most detailed pre-poo video i’ve seen and has always done WONDERS for my hair. *Shampoo - my favorite is from Lotto Body, it always leaves my hair feeling so clean and moisturized! *Deep Condition- warm it up in the microwave first, then apply it to your hair and let it sit for 30 minutes! Then gently detangle. 2. 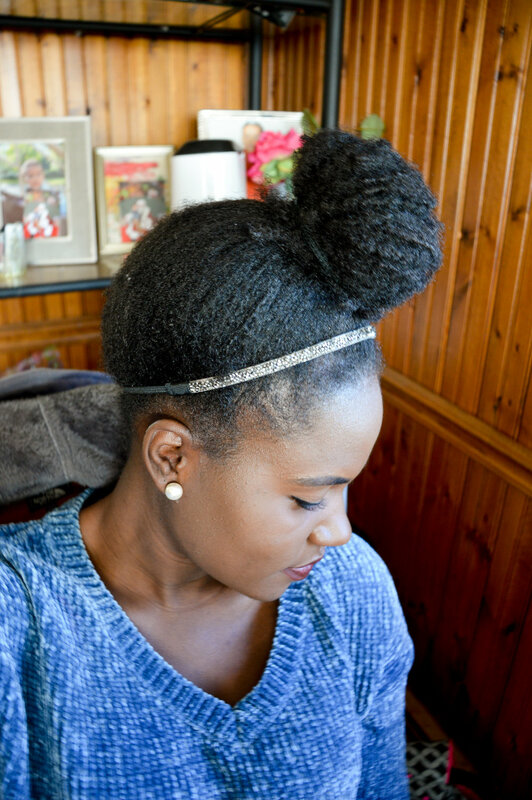 Use the L.O.C method to moisturize your hair! *Liquid (water or aloe vera juice) - If my hair has just been washed I just go from there but if my hair is dry I like to spray aloe vera juice on my hair. *Oil - I usually use almond oil but ever since my breakage started I have been using Castor oil on my edges since its know to promote hair growth. *Conditioner- My favorite leave in conditioner to moisturize my hair is this TGIN Butter Cream Daily Moisturizer. My hair is always so soft and moisturized after!! 3. Low manipulation- this would entail a) protective hairstyles b) staying heatless c) finger detangling hair and d) wrapping hair at night. Hope that was helpful, I will be checking in periodically with hair updates! *Shop my sweater here ! It is insanely soft and currently on a major sale for less than $17 at the Gap with code “HAPPY” !